We’ve mentioned a few times, now, how important it is to target local listings if your business has a specific address. After all, a shop based in Manchester has little value to people in London, so ensuring that the right traffic comes your way is essential. This also has the added benefit of helping with keyword assessment, letting you go for more niche search queries. 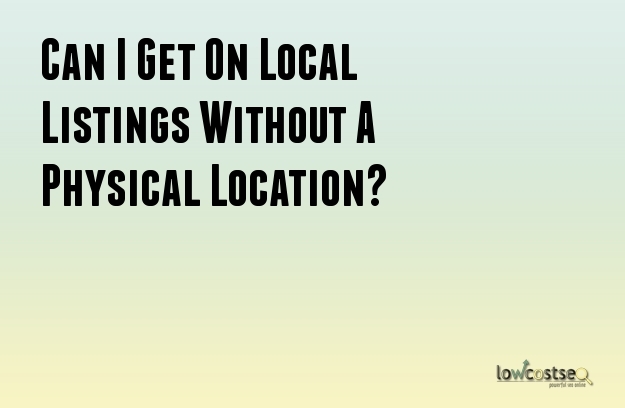 However, what happens when you don’t have a specific location? You might, for example, be someone who can provide services, travelling around a certain area, or a news website focusing on a given region. Such examples don’t have an address to share, so can they still compete for a local listing? Without a location, you can’t appear on Google’s map services, but that isn’t the only option open to you. Google also has a business listing service, known as Google My Business, which received a big update earlier this year. Here, you can input as much information as possible, to help improve your results. Why? Well, why wouldn’t Google use its own tools to support its search results? This also applies to other results, such as social media (Facebook, Twitter and Google+). Use these services to create accounts – mentioning the relevant locations – that search engines can use when crawling. Even without an address or physical premise, you can still target locations. A quick study of existing examples will show that this is highly possible. Like many things with Google, the key is to offer relevance. If someone is searching for “cleaning services in Blackpool”, you are still competing for a place on the SERPs. As long as your website is optimised in this direction, you can still rank quite highly, even above those that are coming up in Google maps and local packs. On the other hand, if your site is quite broad, you might have different sections targeting different areas. This is certainly the case for the likes of job boards, which cover different areas. These are often set-up so users can search by area, in turn generating an URL that includes the location. Additionally, this page will feature that location, so parts of the overall website all push for different locations. It’s best not to get too mixed up with where you target, yet this method of website optimisation will provide a natural development that Google can work with. Of course, you also don’t want pages set-up purely to rank for certain SEO factors if there’s no value. Google’s ever-improving algorithm can detect this, especially if duplicated content is at work. Similarly, there is also a question of scale. Don’t target the whole of London, for instance, if you only operate in a specific borough. Likewise, if you do cover the entire city, individual boroughs might not be so useful. The trick here is in understanding the audience and how well granular their searches are. For local businesses, like butchers and cleaners, people prefer something in their neighbourhood and will search to this effect. For venues, more important services or even one-off queries, they will likely be more willing to search the entire city, opting for “London” rather than their own specific area. In other words, conduct your keyword research accordingly and play to your strengths. Scoring highly for the right terms will help get traffic that actually matters, giving you a chance to improve your conversion rate.